You know, at that ACC website I mentioned above, I forgot that they have a generally robust patterns section. 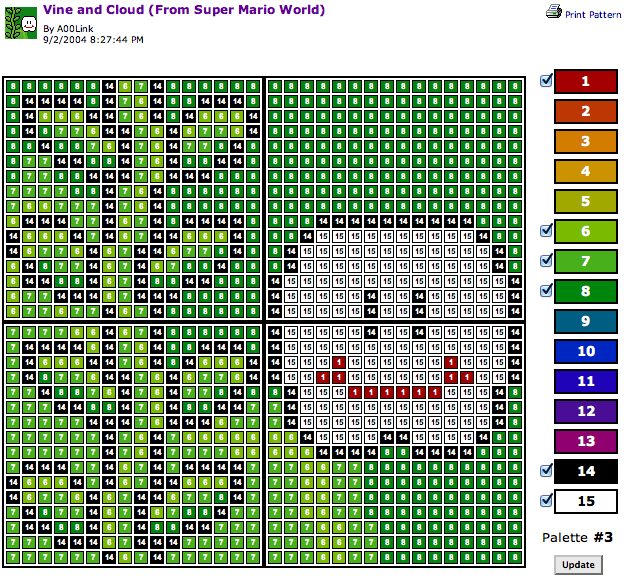 Doing patterns was such a huge point of fun for me. I only ever submitted three myself. I figure I'll post those here for you all. Having only played the first two games, I can't comment on City Folk but even as it neared release, I had next to no interest. Now I know a few things about New Leaf but still haven't read up on its new features too much. I'm still excited to have it return to handhelds though. It's a perfect fit and now that we have the option to get it digitally, it's even better to play this every day and check up on new content. I hope it goes up at a respectable time too (it should be 12pm ET I think...) so I can star the the download and start playing first thing Sunday morning! I like the one on the right! I may need to grab that for my town. I played the heck out of the first Animal Crossing and just a little of the DS game. I'm looking forward to getting back into it. Here's the actual grid for you. It's based on the original Animal Crossing, so I don't know how useful the color scheme is, but it'll help! Save it for later. Ah, sweet! Thanks for this thread, @DrFinkelstein! I'll be downloading this game as soon as I can. This is the PERFECT kind of game to have on a portable, IMO. Being able to pick it up, check out what's happening in town, do a few deals or favors, and then log off again - anywhere and at anytime - is just excellent. Looking forward to seeing y'all's towns in the near future! This has been my most wanted 3ds ever since it was announced and its almost here! Also, I think everyone here is on my 3dd friends list, right? 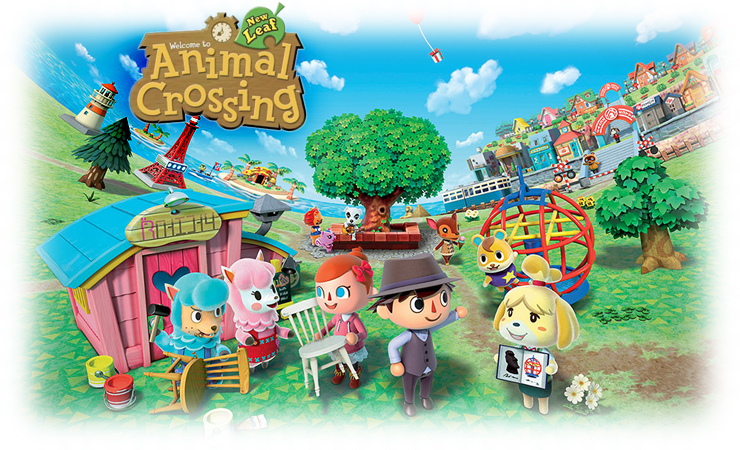 I want to make sure I have all NWers playing ACNL already registered in my system. I'm sorry! I wanted people to know about ACC and I love the series as much as you! I feel ya man! I can't wait, especially for some K.K. Slider jams. So we can play in someone else's town even when they aren't online, right? That's pretty excellent...will make collecting fruit a LOT easier. Can you mess up their towns too? I'd buy this game just for the chance to mine Zero's entire town with Pitfall seeds. Aww. I don't cause trouble in general, just for certain people. CHICAGO STYLE people. Who need to be CHICAGO STYLED back. I'm going to set booby-traps all over my town. I never got all the fruits in my first Animal Crossing game. I hope I can with this one's online multiplayer and all the NW players to help me out! It's kind of weird the things that I get excited for... Fruit diversity. I'm all about helping people out that way...plus foreign fruit meant quick cash in the other games. I'm also hoping for a bunch of coconut trees like I had in the original. Oh I had my entire shore lined up with coconut trees in the original. That was pretty neat This thread is making the wait hard! Muahahahaha. I marked as "owned" even though I don't have it. >: D I am so evil. Also remember to add me. I will be getting the game on release. Wickedsymphony has it as owned too, but I don't know if they have an import copy or not. But I would like to ask you to remove your score since it skews things (ever so slightly). Particularly we like to keep as accurate of a count here with gamer scores so I'd prefer if you ranked it once you've actually played it. Would you mind? I had the same thing. It was wondrous and one of my properties was on the beach so it was quite exotic.